As well as the Yoga HD+, Lenovo has announced three new phones here at MWC 2014 including this - a new flagship handset in its S Series available in both titanium and white finishes. Slotting in above the S850 and S660 (which I've also checked out - be patient!) is this beauty of a handset which, like many high-end smartphones before it, promises all-day battery life. However, with a whopping 4,000MHa battery, the handset can actually live up to its claim. Because the battery is larger than most, the S860 supports on-the-go charging of other devices using the microUSB cable that comes included with the handset. As you can see the device has a brushed aluminum back surrounding the camera, flash and logo. Sorry about the sticky tape that was attached to the device I photographed - the handset had been attached to the stand and I had to rip it off to take a decent look at it. And, as with everything at Mobile World Congress, the device was tethered to the booth. Disappointingly, the large 5.3-inch screen isn't Full HD, with only a 720p resolution, but the colour reproduction on the IPS display is netherless superb. Core specs aren't staggering, but they are competitive with much of the market, with a quad-core 1.3GHz MediaTek processor joined by 2GB of RAM, 16GB of storage, 8 megapixel rear snapper and 1.6 megapixel front cam. I was pleasantly surprised with the quality of the snapper, which could capture some really decent shots even under the bright lights of the Lenovo booth. The side features the familiar volume up/down and on/standby controls while the headphone jack is on top. There's no microSD slot in the S860, but there is support for two SIM cards instead - ideal for regular travellers who need access to more than one network. You can view the network status of both SIM cards in the notifications area. That amount of power should provide at least 24 hours of 3G talk time – but of course it's the other net-connected features that use up power on our smartphones. Android 4.2 Jelly Bean is shipped as standard, but the Lenovo attendant suggested there was no reason why it couldn't get KitKat in future. As you'd expect there are all the familiar Android apps, but everything is presented with the typical Lenovo Android overlay. 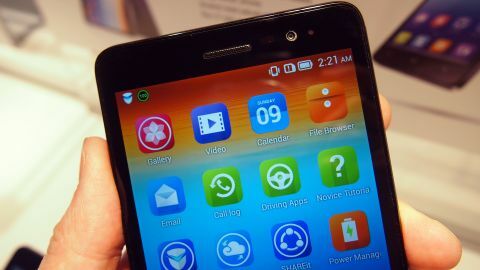 The device also includes numerous built-in Lenovo apps for sharing between Lenovo devices, backing up your contacts and keeping your device secure. The Lenovo S860 is a really lovely handset with a few features that will make it compelling to certain users - notably the dual-SIM support, long battery life and ability to charge other devices are all features to attract regular business travellers. The lack of a Full HD display is surprising compared to other models around, but isn't necessarily a disaster.